A new set of iPhone rumours suggests Apple is releasing three new models this year. TrendForce believes Apple is preparing three new iPhone models for a launch this year, matching previous rumours and predictions. The least-expensive and most common iPhone is likely to be the device with the 6.1-inch screen, TrendForce predicts, because it uses a less expensive LCD screen. 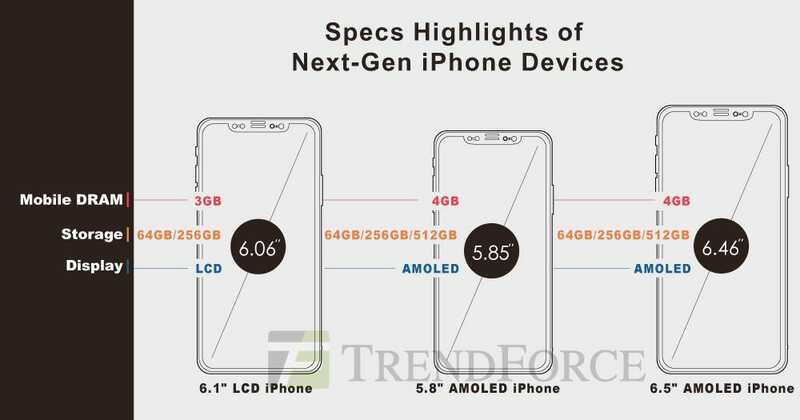 The other two devices will probably use OLED displays, like the current iPhone X, which have better colour and blacks, and Trendforce expects them to have 4GB of RAM. All three phones will have Face ID, Apple’s 3D camera for unlocking the phone using facial recognition, which enables the screen to stretch across the entire front of the device, except for a “notch” on the top. Apple has launched new iPhones in September for the past six years. “All three models are expected to be shipped in September and October as previously scheduled,” TrendForce wrote in the report. TrendForce’s predictions are in line with other reports about the upcoming iPhone. The remaining open question is what Apple decides to call its lineup of devices.